Over at WOW HQ this month is the theme of Spring. 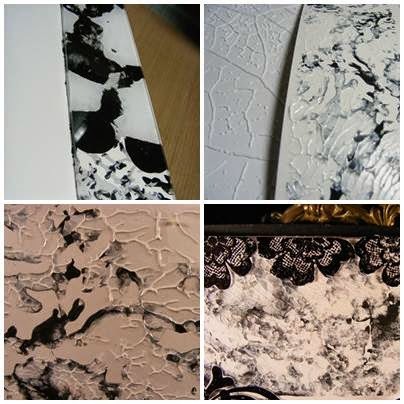 I decided to use the stamps ‘Make a Wish’ and ‘Lace’ in my project and make it monocrome. I firstly made the background by using a leaf embossing folder from Sheena Douglas and white cardstock running this through my E Bosser. I then used the technique ‘background with an acrylic block’. I placed on my Slim Jim’s black and white acrylic paint dots then squashed a further acrylic block on top of this making a pattern with the paint. I then pulled them apart and transferred the paint pattern onto a piece of white cardstock, by placing the block onto the card. I then let these dry. 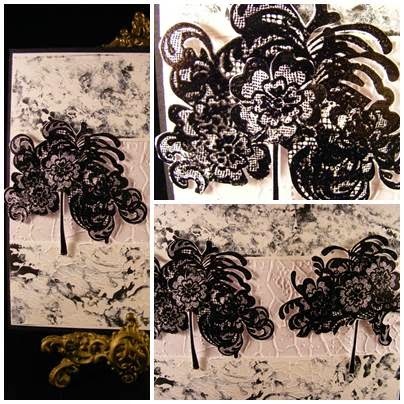 The trees I used the stem from the ‘Make a Wish’ large dandelion and added on top, half of the lace stamp cut like a tree. I then stamped out the lace a further 3 times and cut out the flowers. I used one on each tree and the rest were cut in half and used as decoration on the top and bottom of the card. All the items were stamped and inked with Versamark and heat set with WOW ebony embossing powder. The picture was then framed with black cardstock.